Sourdough starter recipes are a dime a dozen. I have tried so many versions over the years that I have lost track. Some were good, some were OK and some were just blah. To me, sourdough needs to have a particular tang to it. A good starter has a tart, sour, tang to it that’s hard to explain — but once you taste it you’ll never forget it. This is my very favorite sourdough starter. You can use for biscuits, bread, pancakes, or anything else you use sourdough in. Always start with rye flour. Always use non-chlorinated bottled spring water. Always keep it in a warm spot with cheesecloth over the top. The cheesecloth allows the tiny wild yeast spores to fall into the slurry you are going to make with the water and the rye. The rye gives it something to eat. If you use white flour at this point the wild yeast won’t have enough to eat. the spring water ensures that there is no chlorine to kill the good bacteria and yeast. You are going to commit to this starter for a week. You can’t start your sourdough starter and then go out of town, OK? You’ll need a quart jar, a screw on ring but not a top. Remember, you’re going to use the cheesecloth so the starter gets plenty of air. You might want to keep a small dish under the jar of starter. Mine almost always bubbles over and makes a mess. 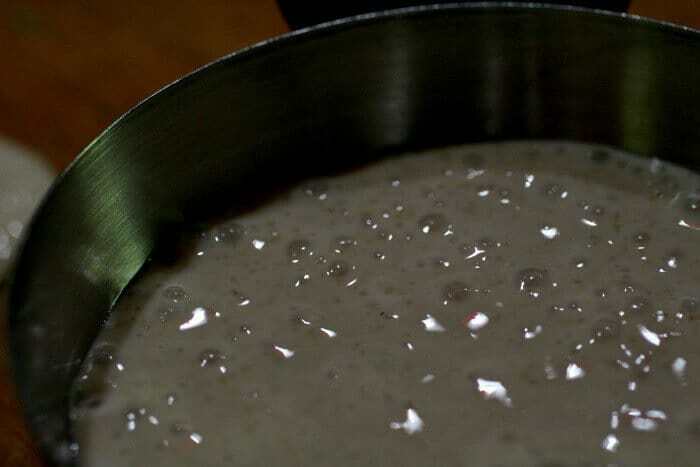 Many sourdough starters tell you to add yeast in the beginning. If you follow directions carefully you won’t need to add yeast to the starter, it will become active — light and bubbly — on it’s own. This is a great homeschool project — I’ve pulled science, history, cooking, and math out of this stuff! Let’s just work on the starter for today. I’ll post my sourdough recipes next week so you’ll have time to get your sourdough going. 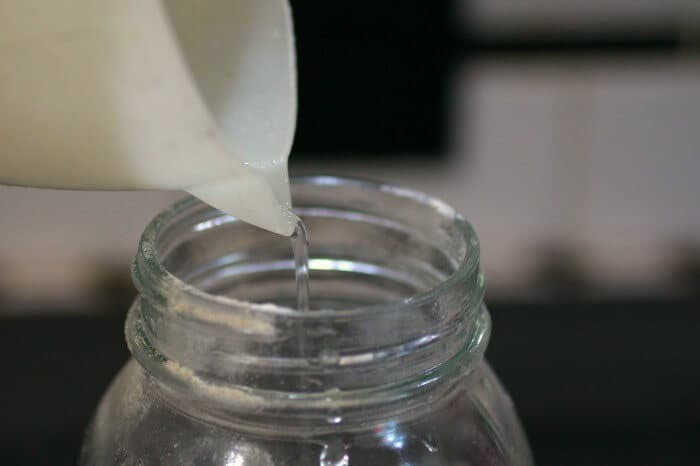 This homemade sourdough starter is one of the best you'll ever try. It becomes active without the use of commercial yeast and develops a sharp, tangy flavor that is the hallmark of good sourdough bread. Put the rye flour into a clean, sterile quart jar. Add the water and mix until all of the flour is incorporated. 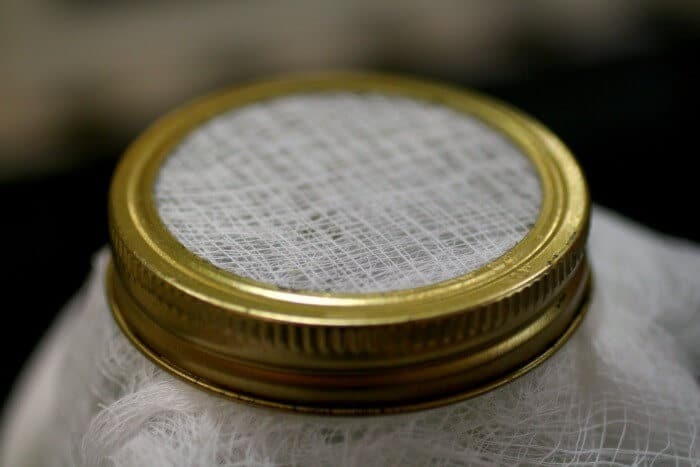 Place a cheesecloth square over the top and screw on the ring to hold it in place. Remove 1/2 cup of the starter and throw he rest of it out. Pour it back into the jar. Add 1 cup of bread flour and 1/2 cup spring water and mix thoroughly. Replace the cheesecloth and ring and put in a warm place. By day three you should start to see some bubbles and activity. Remove 1/2 cup of the starter and throw the rest of it out. Add 1 cup bread flour and 1/2 cup spring water. Do this TWICE a day, as close to 12 hours apart as possible. 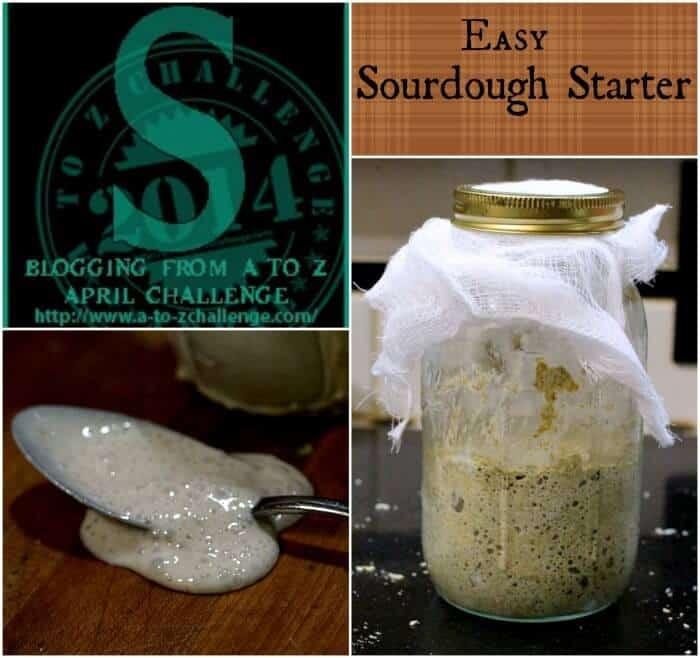 By day 7 your starter should have a pleasant, sour tang and double in size within 12 hours. Always keep 1/2 cup starter and make your bread with the rest. You can either keep it in the refrigerator or feed it (1 cup flour and 1/2 cup spring water) at lease once a day. It tends to keep better if you keep it out and feed it. You don't have to throw all of that starter away - if you happen to know other bread bakers feel free to share. Prep time is 7 days. I was more ill than I knew because I didn’t even get to read your s.d. starter that morning; I just opened your email and was so happy to see your s.d. info with starter directions. I just knew you had one. For so long I tried to buy your Bread book on Amazon but it never went through (fate) I guess as it was too soon..I am now where I needed most to find your info. Mary, I have a burning question and will email it to you. I am sorry I didn’t’t contact you sooner for many reasons. I was so exited to start this recipe , I had been looking for a long time for a good one , to begin with Rye flour is very hard to find in my area and when I did it came only in Organic and expensive for a small bag . Well I followed the first step exactly and all I got was a big glob of hard ( can’t even call it dough ) it did absolutely nothing . I don’t know what went wrong , any suggestions ? I don’t want to try again I know what went wrong due to the lack of flour . 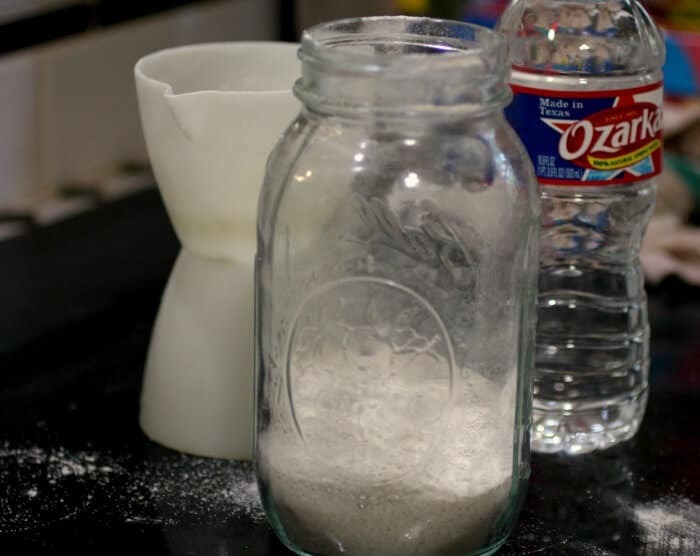 If you are sure you used 1 cup of flour to 1/2 cup non-chlorinated spring water… and you are sure you measured the flour properly then I don’t know. :/ You can use whole wheat flour for a starter if that is easier to find. I make bread often and have made a name amongst my friends for my french bread but I have never done sourdough even though it is truly my favorite. Coming from San Francisco I got spoiled on this stuff, but I have never been patient enough to stick with it. In reading your directions though I have one question, bare with my if this is a silly question. If, every day to only keep a half a cup of the stuff from the day before and keep doing this day after day how do you end up with enough to make bread when you need 3 cups of it to make one batch of bread and still need to keep enough for you starter? Am I missing something> As I said I have never done this before. I used to but I don’t anymore. 🙂 I never use it all up since so many of the kids now live on their own. Do you feed your starter once a week 1 cup flour and 1/2 cup water or do you feed this amount once everyday on e it is established? Once it is established I just replenish it when I make breadd which is often, other wise I’d feed it maybe 3 times a week?